Says President Barack Obama’s recent New York fundraising trip "cost between $25 million and $50 million." By Jon Greenberg on Tuesday, October 14th, 2014 at 1:53 p.m.
With President Barack Obama’s low approval ratings already weighing down Democrats in the mid-term elections, his Republican critics like nothing better than giving voters more reasons to think less of him. Accordingly, billionaire and occasional presidential aspirant Donald Trump called out Obama for the cost of his recent New York fundraising trip. "He raises a million dollars and it costs between $25 million and $50 million, and they close up the entire city of New York," Trump said Oct. 13 on Fox News’ Fox and Friends. We reached out to Trump to learn where he got his numbers and didn’t hear back. But we wondered, would a one-day New York trip cost between "$25 million and $50 million"? The president made a one-day trip between Washington and New York on Oct. 7. According to the White House schedule, from take-off at Andrews Air Force Base to return took a bit over nine hours. In New York and Connecticut, Obama attended two events for the Democratic National Committee and one for the Democratic Senatorial Campaign Committee. Obama traveled to John F. Kennedy International Airport in New York via Air Force One, which is the call sign for one of two 747 jets specially equipped with communications gear so the president is always able to respond in an emergency. According to a 2012 report from the Congressional Research Service, the policy arm of Congress, the hourly cost of Air Force One is $179,750. 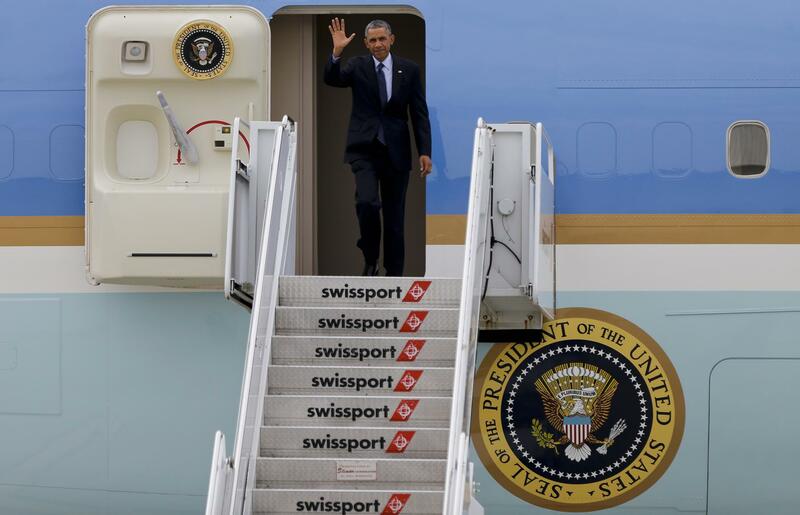 On domestic trips, a cargo aircraft and a backup aircraft normally accompany Air Force One. For the purposes of Trump’s calculation, that would put the total cost of the air travel between $360,000 and $1.6 million, assuming a range of two and nine hours of usage time for Air Force One. Note: Under the rules of presidential travel, when the purpose of a trip is political, not official, the president’s political organization reimburses the government. For airfare, the price is based on the cost of a commercial ticket for the president and all those who accompany him. In this case, the Democratic National Committee and the Democratic Senatorial Campaign Committee would be on the hook. In addition to the aircraft, there would have been a Secret Service cost, but those figures are classified. There also would be security costs for the New York Police Department. Foreign travel requires much more staff and equipment than the one-day jaunt Obama made to New York City. In Africa, for example, the Marines sent a helicopter squadron. The Air Force deployed five additional planes and ran refueling missions. The Chilean trip pulled in about 600 staffers from a variety of agencies. There were hotels and meals to pay for. While we can’t know all the details of Obama’s New York jaunt, there is no evidence that it approached the complexity of either of the lower cost trips in the GAO report. And if those trips halfway around the world came in at about $3 million per day (in today’s dollars), it is extremely likely that a back-and-forth to New York would cost less. Much less. Bottom line: Presidential travel is expensive, but Trump’s estimate of Obama’s fundraising trip to New York is wildly high, based on everything we know. Trump said Obama’s recent New York fundraising trip cost between $25 million and $50 million. Trump provided no evidence, likely because all the available information points to a total that would be way, way lower than $25 million, let alone $50 million. Published: Tuesday, October 14th, 2014 at 1:53 p.m.